The rumble of trains on the Manhattan Bridge is a constant reminder that you are in the Two Bridges neighborhood in Lower Manhattan. 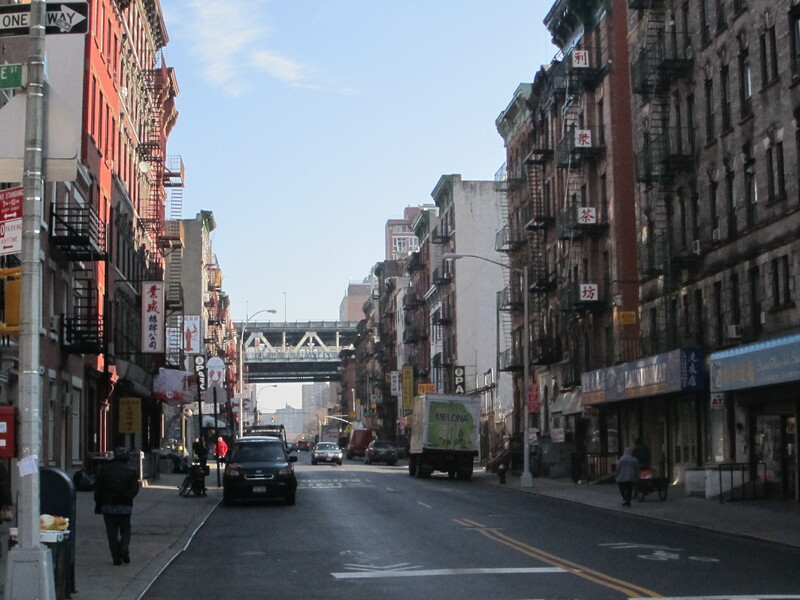 What used to be a traditionally Jewish, Irish, and Italian neighborhood has now become homebase for many newly-arrived Chinese immigrants from Fujian Province. 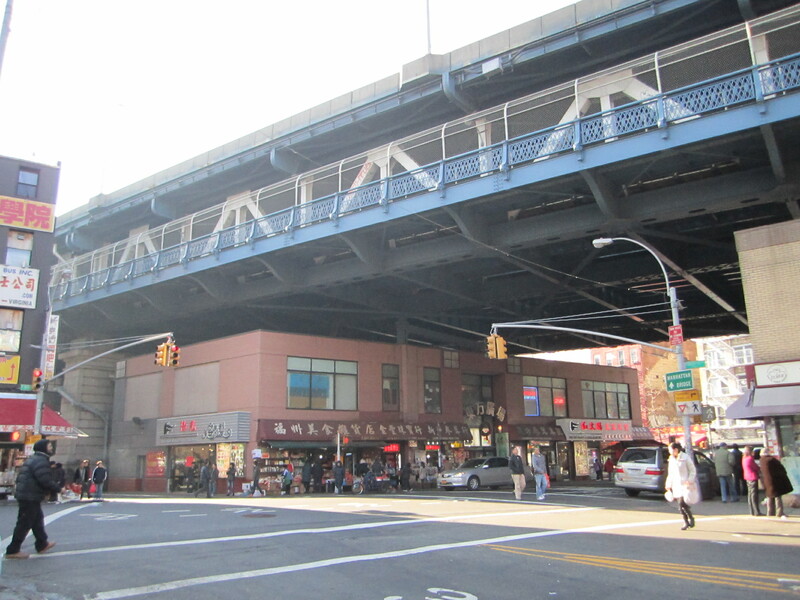 In the shadow of the Manhattan Bridge on East Broadway lies a bustling mini-mall of sorts with noodles, candies, and dried seafood spilling out onto the sidewalk. Red envelopes and scrolls with good luck wishes are displayed as Chinatown readies itself for the Lunar New Year. 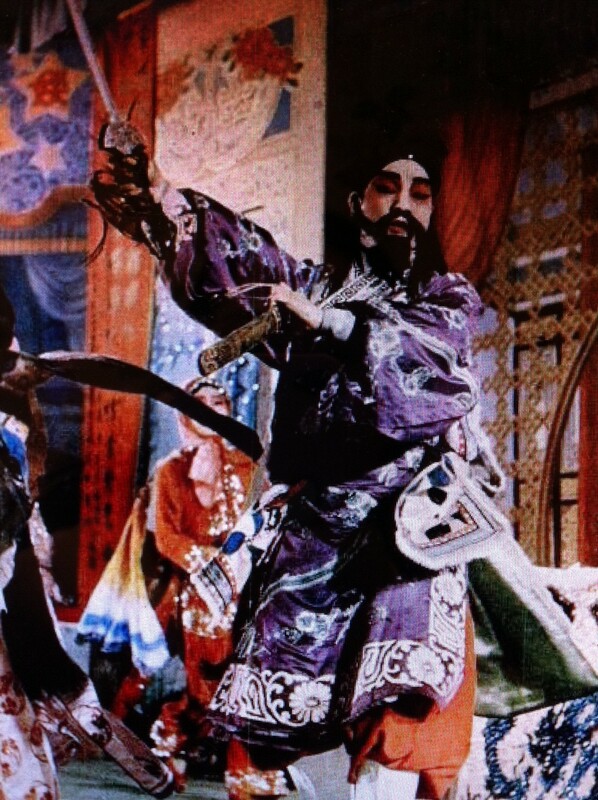 An actor performs as a Tiger God in the opera "The Beautiful Butterflies". From Life Magazine, May 1, 1950. A ticket stub from the New Canton Theater found in between the pages of a book. In 1950, the theater was renamed again, this time as the Sun Sing Theater. Shortly after, Peking opera ceased production and the Sun Sing began to show Cantonese films. In the 1970s, the city needed to build an additional deck to the Manhattan Bridge and Sun Sing Theater was in danger of demolition. With many Chinatown residents working long hours day after day in restaurants and sweatshops, Cantonese cinema was one of the few affordable and pleasurable escapes they had in the community. Theater fans rallied to save the building and engineers were able to compromise by eliminating some theater seats and adding supports so the structure could remain intact. 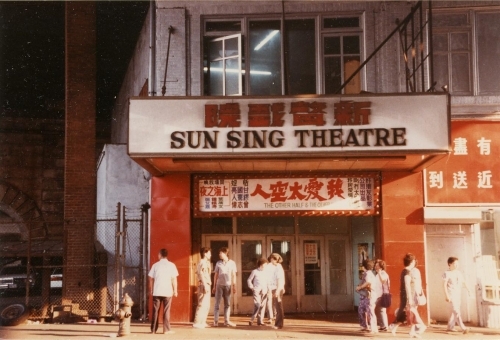 Considered the grandest of all Chinatown theaters and known for showing double features (a rarity these days), the Sun Sing Theater presented Cantonese films, occasionally with English subtitles. During the theater’s sunset years, a marketing effort was made to reach out to English-speaking fans of Asian crime and martial arts movies; moviegoers were provided with a short, typed-up synopsis of each film after paying for admission. In fact, real life mirrored fiction as Sun Sing became the location of Chinese gang-related shootings and activities. Nonetheless, Chinatown residents, coming from an urban Hong Kong tradition steeped in Cantonese cinema, continued to patronize the theater. 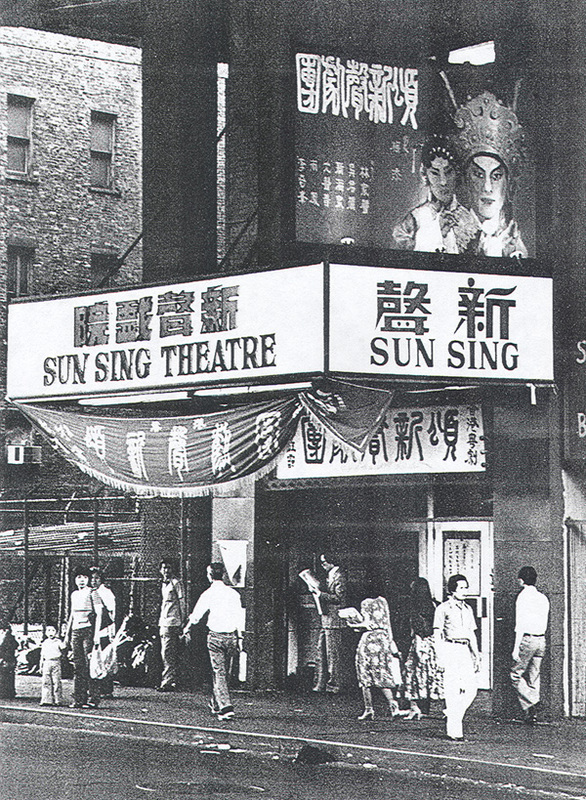 The Sun Sing Theater was one of five theaters in Chinatown; all are gone now, with the last one, the Music Palace on Bowery, closing in 1998.